Acute leukemias are clonal malignant disorders resulting from genetic alterations in hematopoietic stem cells that limit the ability of stem cells to differentiate into red cells, granulocytes, and platelets, and lead to the proliferation of abnormal leukemic cells or “blasts.” Acute myeloid leukemias (AML), also referred to as acute nonlymphocytic leukemias, are heterogeneous disorders. The current World Health Organization (WHO) classification scheme of acute myeloid leukemia and myelodysplastic syndrome (MDS) has evolved away from the French–American–British (FAB) classification scheme, which only uses morphologic features for classifying those neoplasms. 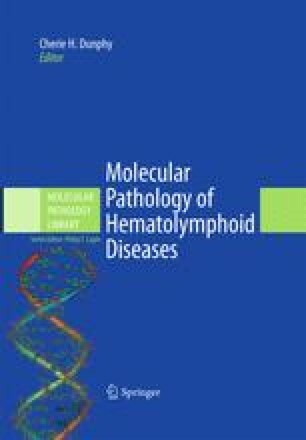 The current WHO classification scheme includes not only morphologic features, but also clinical, immunophenotypic, and cytogenetic features. The current 2008 WHO classification includes four main categories of AML: AML with recurrent genetic abnormalities, AML with myelodysplasia-related changes, therapy-related myeloid neoplasms, and AML not otherwise specified (Table 34.1). The pathogenesis and underlying molecular processes substantially differ between each of these AML groups: AMLs with recurrent cytogenetic abnormalities are discussed in this chapter after a general introduction to the topic. However, AMLs with mutated NPM1 and AMLs with mutated CEBPA will be discussed in Chap. 35, as will AMLs with normal cytogenetics. AMLs with myelodysplasia-related changes and therapy-related AMLs are discussed in Chap. 36.